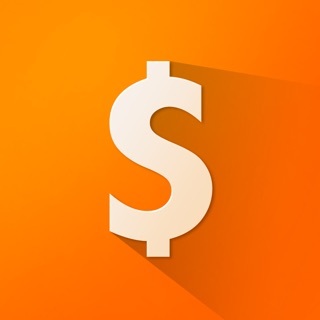 There are thousands of savings app out there; you may have tried many yourself. Problem is they don't work well. You use them for a few days, weeks or even months and then stop. 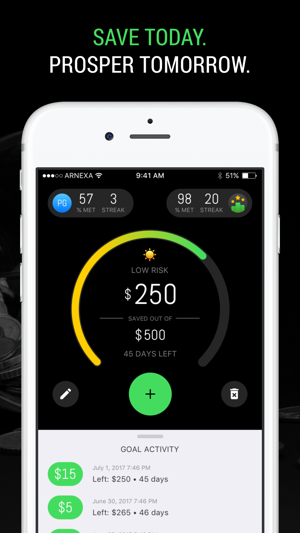 Our app is focused like a laser on getting you hooked to saving. 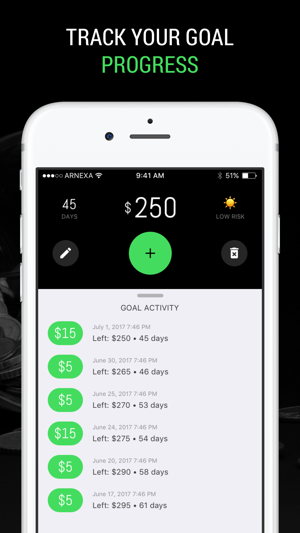 Drawing from other areas of habit formation (like losing weight, combating addictions, or excelling in sports), our app brings together simplicity of setting and tracking savings goals, a community that challenges and inspires, and celebrations that provide accolades on goal achievement! Using our app is super simple. You should be up and running with your first savings goal in under a minute after installing the app. 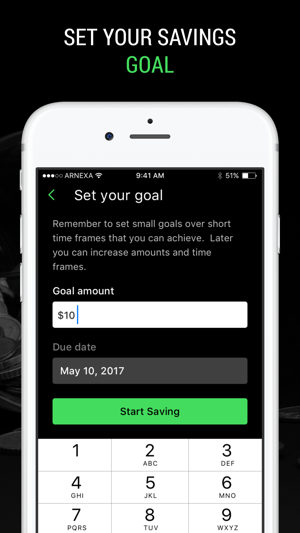 First, set your savings goal (amount and target date). Small amounts and duration are recommended initially. Why small? Think of these initial goals as "warm up" or "practice" goals. Get into the habit of meeting the goals you set, get familiar with our app and how to use it. Once you meet your initial goals, you will see that you don't want to let go of "hot streak" you are on! 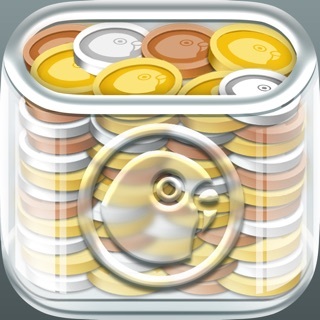 Then, you can slowly raise the savings goal difficulty. Second, check-in with our app each day (or, more often) to report on your progress towards the goal. Anytime, you decide to defer or forego an expenditure, record the savings as progress towards this goal! We will send you a helpful notification to your phone each morning reminding you of where you stand with your savings goal. Third, when you meet the savings goal, we celebrate with you! We also show you who the top savers are on the leader board - as an incentive for you to continue to save and perhaps aspire to do better in the future! You can, at your option, share your goal success with your friends on Facebook. This will energize you and also excite your friends into saving more as well! 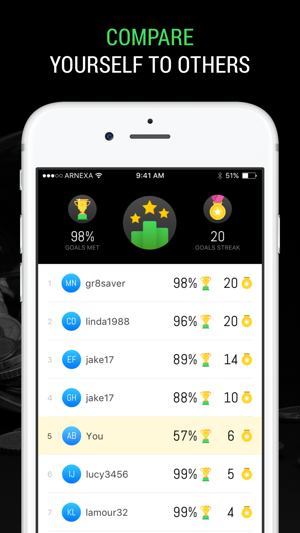 As you save, our app computes your "streak" (number of consecutive goals met) and other interesting stats. Keep your eye on these stats to make sure that you maintain your position and perhaps even advance on those ahead of you! 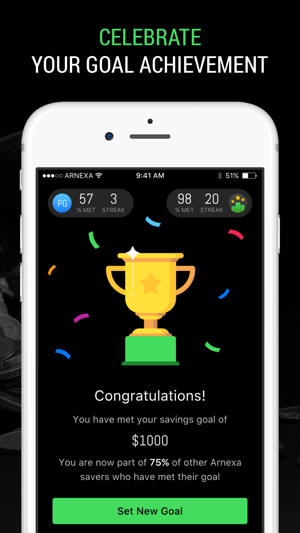 Don't worry - our app is smart enough to ensure that the leader board does not get dominated by wealthy savers. Instead, if you save diligently and keep meeting the goals you set, and slowly raise the savings goal difficulty, you will see yourself slowly advance on the leader board! Lastly, do remember that once you have recorded savings in our app, you should log in to your bank account and move the money saved to your retirement account or to your savings account - somewhere where you cannot spend it easily! This is super important as well to make sure that you are truly growing your savings and setting yourself up for a more prosperous tomorrow! So come join us - don't just set savings goals. Get into the habit of meeting them. I want to give it 5 but can’t. For one, to my knowledge, and I’ve looked several times, there’s no way to SUBTRACT money, only add. Sometimes if you make a mistake or have to spend some of your savings in an emergency for example, there’s no way to subtract it so you can see where you’re really at. Also, there’s no way to see a true risk assessment. It shows you a scale but you can’t click on it and get a “at this rate you’re 70% likely to hit your goal by blah date” or something of that nature. Other than that it’s easy to use and one of the only apps I’ve found that does what it says instead of twelve other things I don’t need. 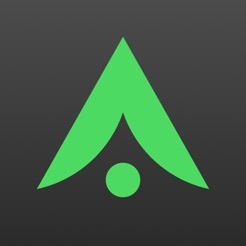 Love the simplicity and focus of the app. Just what I needed. To do agree with other reviewers that having a way to enter withdrals / negative amounts would be useful. Many thanks for making this excellent app! Setting up email to invite someone. When you go to send by email. You tap on the bar to do it and it tells you you have to set up an email account. But I cannot see anywhere in the app to set up a email account to be able to do this. ?? a) If you don't have an active email account, set one up. You can do this for free at Gmail.com, Outlook.com or many other free email providers. b) Then, create your account in the Arnexa app. Our app will ask you to enter your email address. Once you enter your email address, our app will send a verification code to that email address. c) Open up your email, look for the email from Arnexa. If you did not get it, make sure that you check your spam/junk email folder. If you still did not get it, click 'Resend' from within our app. d) Once you have code, enter the code in our app. You should now be all set and ready to use the app! Hope this helps! Good luck and happy saving towards a better financial future for you!